Amazon is looking for a second home in the United States that would be similar in size to their Seattle Headquarters and result in a $5 billion investment. 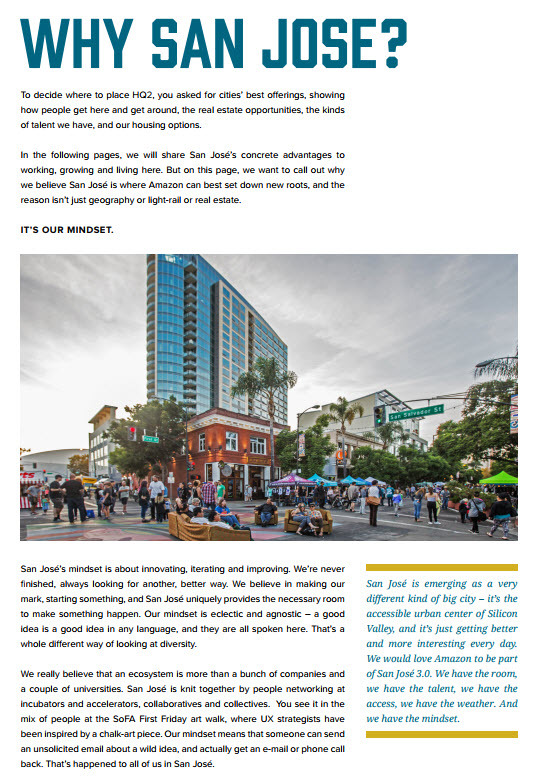 San Jose has officially put their hat in the ring with a compelling proposal which you can find here. Nathan Donato-Weinstein also has a blog post that summarizes the proposal. We do have the best technical talent in the world and San Jose can not only accommodate the 8 million SQFT of office space they are looking for, but we nail all of their other requirements which include great educational solutions and access to international airports (we've got 3 of them within a 45min drive). The only thing we don't have is the will to hand out huge subsidies like other cities are doing. We really can't afford it and it is not a sign of true partnership when the community has to suffer at the expense of a corporate deal. The jobs would be great for the economy, but without the tax dollars to provide supporting infrastructure around that much space, we would see our biggest issues like housing and traffic become even greater pain points. So, if Amazon wants the best location for HQ2 (San Jose of course)--they are going to have to open up the checkbook a little more. To learn more about our proposal to Amazon, head over here.